I’ve just watched the first episode of Can’t Read Can’t Write a new documentary series on Channel 4. The series follows a group of adults aged between 21 and 58 that can’t as the title says read or write. I am shocked and disgusted that a person can be allowed to leave school without even elementary reading and writing skills; it is a terrible enditement of our education system. The programme featured a 28 year old man who had clearly struggled at school but instead of receiving extra attention or encouragement he was given word-searches to do at the back of the class. He would be sent home at lunchtime, as English was taught in the afternoon, and the teachers said there was no point him being in the class. This man wasn’t being taught in the dark ages; he’s 28 years old, 10 years younger than me. Whilst I was reading the information on Channel 4’s website I saw the image you see here and it made me think of my own education and the gaps therein. 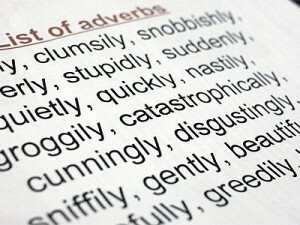 You see I don’t really know what an adverb is. I was never formally taught grammar at any point in my schooling and to this day I’m ever so slightly jealous of people that know what a past-participle is and how to use one. I mentioned this to a friend’s Mother, who has taught all her life, she explained that it wasn’t fashionable to teach grammar in the 70s; it was thought we would learn it from reading books. I find this appalling as well; because of some liberal experiment in the 1970s I was supposed to go through life with little formal knowledge of English grammar – something I have tried to remedy. However as I sit here writing this post before heading to bed to read a book (on economics – which is another story) it’s clear that I haven’t been failed by our education system as dramatically as the people featured in Can’t Write Can’t Read.